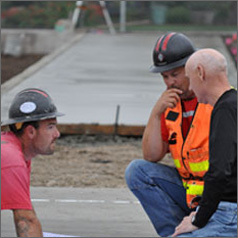 John Hyland Construction has evolved over four decades of family ownership to become one the Pacific Northwest region’s most trusted full-service construction companies. A reputation we’ve secured by building not just successful projects, but also by establishing long-standing relationships with Owners, Architects, Engineers and community members. Whether in a CM/GC, Design/Build, or Competitive Bid format, the self-performing Hyland team is uniquely equipped to handle every phase of the construction process from pre-construction to project completion. This is the full-service approach that frames every Hyland project and defines our mission to remain a leading commercial contractor with wide ranging skills and capabilities. Our tremendous growth over the last 40 years has not diminished one of our core principles: to retain the character and integrity of a trusted family business. We understand that being accountable for the quality of products and service is vital to the ongoing success of our company, our client relationships and the projects we build. For our clients this means assurance that the team they hire is the team that will be on site – completing the job with exceptional skill, timeliness and economy. Many construction companies talk about their “in-house” resources in regards to micro management teams, who often farm out a majority of the work to subcontractors. At John Hyland Construction, our valuable in-house resources are represented by a team with diverse skills and knowledge. We employ project managers, estimators, superintendents, carpenters, equipment operators, laborers and truck drivers, who’ve proven time and again their abilities to ensure the completion of every Hyland project – on time and within budget. John Hyland Construction understands the process of collaboration, and that it only works when we remain accessible and responsive to the Owners, Architects and Engineers through the design, construction and post-construction phases. We often work with the same companies on multiple projects, which speaks to the teamwork principles we uphold. Being accountable, self-performing and dedicated to the team – it’s a business philosophy that’s built our reputation as a regional construction leader with wide-ranging capabilities.